THE AMERICAN DREAM VOL. 1 – Welcome to EZ Edit Music ! 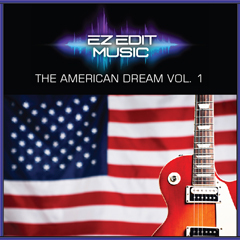 This collection is comprised of music loops that are useful for content that evokes a patriotic, triumphant or uplifting mood; such as for political campaigns or documentary videos. "A New Beginning" Stereo-mix plus stems. "Remember The Heroes" Stereo-mix plus stems. "March To Victory" Stereo-mix plus stems. "Honest Day's Work" Stereo-mix plus stems. "Solemn Promise" Stereo-mix plus stems. "Through A Child's Eyes" Stereo-mix plus stems. "Warm Hearts" Stereo-mix plus stems. "Open Road" Stereo-mix plus stems. "Building The Future" Stereo-mix plus stems.